The Saudi-led Arab Coalition to Support of Legitimacy in Yemen denied targeting its fighter jets residential neighborhood in the Yemeni capital Sana`a, killing 13 people, mostly schoolgirls, and injuring about 100 others. Coalition spokesman Colonel Turki al-Maliki said in a statement on Sunday that the Houthi Group (Ansar Allah) was responsible for the bombing in Sana`a. He stressed that the incident in Sana`a was alleged to have been caused by an explosion at the Houthi arms and explosives factory, denying the claims of the Houthis that the coalition had launched air raids on civilian area there. "What the Houthi militias are marketing through their loyal or loyal media is baseless," Maliki said. He said that the leadership of the joint forces of the Arab coalition denies that there is any targeting inside the capital Sana'a, or that there will be any military operations in the city on Sunday. The spokesman for the coalition forces pointed out that the military operations are continuing throughout the territory of Yemen, to liberate them from the Houthis, adding that "the front near Sana`a, which is conducting military operations of the Yemeni National Army, with the support of the coalition, is in Nehm in the east of the Yemeni capital Sana'a ". The news channel Sky News Arabic reported that 20 members of the Houthis were killed inside the factory, located next to a school in Sa`awan area east of Sana`a. According to news reports eyewitnesses said the coalition aircraft launched several air raids on military police camp east of the capital Sana`a away from residential areas. Military sources claimed that the Houthi group had turned the camp into a training center for its operatives and a weapons storehouse. 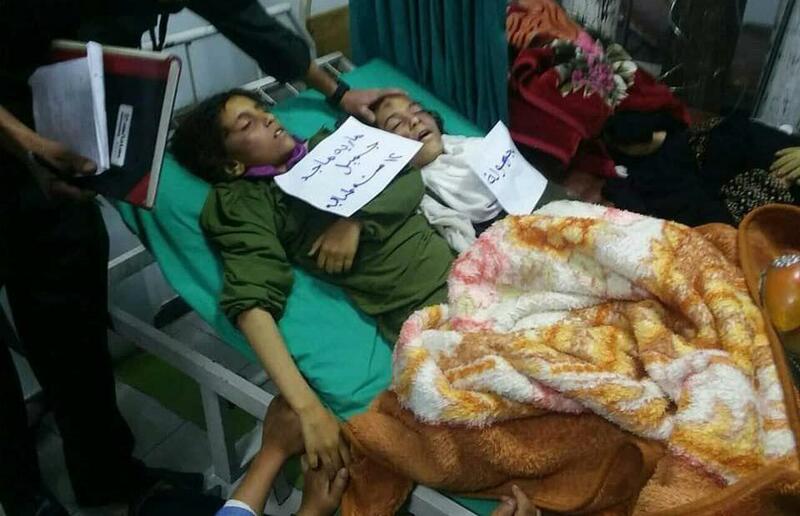 The Houthi group announced on Sunday evening that the victims toll of the Saudi-led Arab coalition air strike on a school and houses in the residential neighborhood of Sa`awan increased to 13 people, and 92 injured mostly schoolgirls. The health minister of the Houthi Salvation Government, Dr. Taha al-Mutawakil, said during his visit Sunday to the injured in Sana`a hospitals that the death toll was 13, mostly students, and the wounded, 92 of them women and children, were distributed to various hospitals. He said the targeting was a "war crime", according to theYemeni Houthi-run "Saba" News Agency.